The Booted – Facebook group – discussion group for people who have attended Boot Camp – email Jim McCarthy with your Facebook login for more info. This is a discussion group for people interested in the Core Protocols. Jim and Michele McCarthy are here, as well as other trainers, Boot Camp participants, people who are Booting themselves and their teams, and people who’ve encountered the Core for the first time. 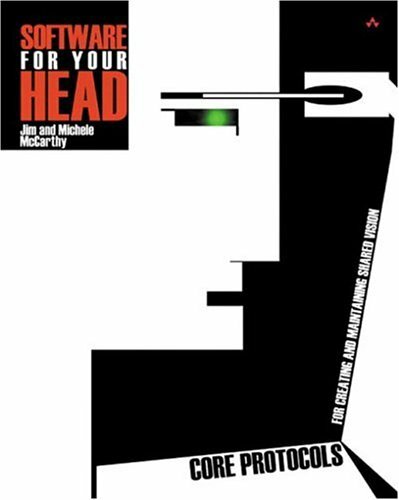 Software For Your Head by Jim and Michele McCarthy – a great introduction to the Core, or for people who want to go deeper. The vision behind the Core Protocols, their benefits, and how to use them. Available online at the link above. The McCarthy Show – Jim and Michele McCarthy. The originators of the Core Protocols. They do training, coaching, and speaking. The website has links and articles, and a great set of informative and funny podcasts about using the Core Protocols to create great teams. Core Instructor Certification. USA. Adam Feuer – Certified Core Instructor. USA. David Gerding – Certified Core Instructor. USA. Vickie Gray – Certified Core Instructor. Canada. Yves Hanoulle’s Pair Coaching – Certified Core Instructor. Europe. Paul Reeves – Certified Core Instructor. Canada. Rachel Rutherford – Certified Associate Core Director. USA. Sylvia Taylor – Certified Core Instructor. USA. Rich and Char Tosi – couples counselors. Jim and Michele McCarthy highly recommend their Couples Weekend, Woman Within training, and New Warriors training. USA. If you want to offer improvements to this list of resources, or are a Certified Core Instructor or Director and would like to be listed here, please contact me using the address on the About This Site page.